Kelly M. Welch joined the firm in 2005 and concentrates her practice in trusts and estates, real estate and commercial banking. She has extensive experience in all facets of real estate transactions, both residential and commercial (purchases, sales and leasing), including resolution of complex title problems, zoning issues, and new construction. She also advises condominium homeowners associations and cooperative boards on a variety of legal and administrative issues. 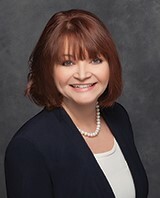 Ms. Welch is the current President of the Westchester County Bar Association and is a Member of the New York State Bar Associations’s House of Delegates.